TESTA ROSSA (AUS) (1996). 13 wins-5 at 2, VRC Lightning S., Gr.1. Sire of 981 rnrs, 727 wnrs, 64 SW, inc. Ortensia (WATC Winterbottom S., Gr.1), Enzo's Lad, etc. Sire of the dams of 484 rnrs, 304 wnrs, 13 SW, inc. Global Glamour, Marky Mark, Anaheed, Disposition, Snippets Land, Vow and Declare, Ploverset, Qiji Phoenix, Lim's Racer, Lycurgus, Le Chef, Feltre, Grand Dreamer, SP Beyond the Fort, Smart Elissim, Zoubo, Speedonova, Reemah, Whistle Baby, etc. Mica Lil (f. by Testa Rossa). 5 wins. See below. Witz End (g. by General Nediym). 7 wins-1 at 2-to 1400m, NZ$75,400, Matamata RC Rich Hill Stud H., 2d ARC NZB Ready to Run Sale 2YO H., BOP RC Seeka Kiwifruit Industries H., Counties RC Lewis' for Fashion Pukekohe 3YO H., 3d Manawatu RC Rich Hill Stud 3YO S.
Stratocracy (g. by Stratum). 3 wins at 1400m, 2000m, 3d MVRC TBV Newmarket Insurance H.
Seven Degrees (g. by General Nediym). 2 wins at 1200m, 1600m in Aust. Savage Garden (f. by Choisir). Placed to 2018-19 in South Africa. NIGHT'S WATCH (Redwood). 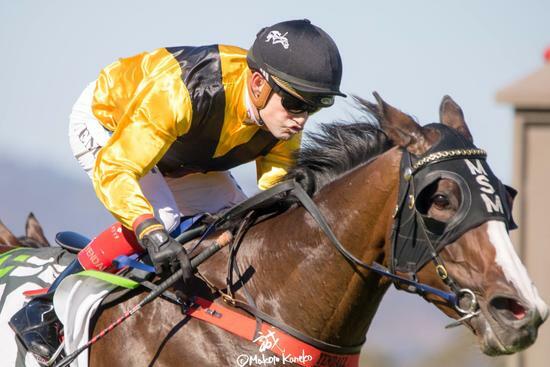 8 wins from 1200m to 2000m, NZ$9,350, A$468,000, to 2018-19, MRC Naturalism S., Gr.3, Jockey Celebration Day H., Cape Grim Beef P., Ladbrokes H., Cove Hotel H., 2d VRC Damian Cubela H., Country Cup, 3d MVRC Dato' Tan Chin Nam S., Gr.2, MRC TS Carlyon Cup, Gr.3, 4th MRC Peter Young S., Gr.2. FAIRYGEM (Viscount). 5 wins from 1800m to 2400m, A$234,511, AJC Australia Day Cup, L, MRC Carpet Call Cup H., Bruce Patchell H., Hayai H., 2d Sportingbet Moonee Valley Night Cup, MRC Highland H., 3d Mornington Cup, L, 4th SAJC Adelaide Cup, Gr.2. Producer. Tearinupthecountry. 7 wins from 1400m to 2200m, A$225,350, WATC Tapdog H., Amelia Park Lamb H., Westspeed Stayers' H., 2d WATC Baileys Coffee H., Broome Cup, WATC Superior Star H., Broome Cup, 3d BTC MBS Architects H., Chaps Menswear H., WATC Herdsman Lake Tavern H., Westspeed Stayers' Bonus H., QTC Network Ten H.
Gemstone. 6 wins. See above. ASH BLOND (Mighty Avalanche). Joint third top filly on The 1994-95 NZ 2YO Free H. 6 wins-4 at 2-to 1350m, ARC Welcome S., L, Schweppes Juvenile H., DB Draught Juvenile H., Rotorua RC Carson Taylor Ford 2YO H., 2d ARC Eclipse S., Gr.3, 3d Matamata Breeders' S., Gr.2, Waikato RC Star Way S., L. Producer. ENTIRELY PLATINUM (Pentire). 6 wins from 1400m to 1900m, A$594,910, ATC Sky High S., Gr.3, Canterbury Hurlstone RSL H., 2d MRC CF Orr S., Gr.1, Memsie S., Gr.1, Naturalism S., Gr.3, 3d VRC Makybe Diva S., Gr.1, MRC PB Lawrence S., Gr.2. FOXY BLONDE (Volksraad). 6 wins from 1200m to 1600m, NZ$81,925, Otago RC White Robe Lodge H., Gr.3, James Hazlett S.H., L, ARC Pinto H., 3d ARC Veranda Bar & Grill H., 4th Counties RC Auckland Thoroughbred Breeders' S., Gr.2, Otago RC White Robe Lodge H., Gr.3, James Hazlett S.H., L. Producer. Roving Owl (Volksraad). 2 wins at 1100m, 1550m, A$108,860, AJC Young Members H., First Fleet H., 2d STC Tulloch S., Gr.2, 3d BTC Rough Habit P., L.
James Blond - Travel Leader (H.K.) (Danske). 3 wins at 1800m, 2000m, NZ$9,500, HK$2,155,970, HKJC Elizabeth Arden H., Mui Wo H., Sutherland H., 2d ARC Guineas Trial, L.
ANALYST (Deputy Governor). 12 wins from 1000m to 1800m in Macau, Macau Chairman's Challenge Cup, L, Spring Trophy, L, Macau Derby, L, Macau Cup, L, 2d Macau Cup, L.
KARAVALI (Nadeem). 5 wins-1 at 2-from 1000m to 2000m, NZ$16,075, A$289,880, to 2017-18, ATC Aspiration H., Gr.3, Elite Sand & Soil Mile H., Chambers Russell Lawyers H., 2d ATC Schweppes H., Theraces H., 4th Manawatu Sires' Produce S., Gr.1. SIR NATE (Nadeem). 4 wins-3 at 2-from 800m to 1600m, NZ$177,875, to 2018-19, WRC Wellesley S., L, Gavelhouse.com Auction Online 2YO H., 3d New Zealand Two Thousand Guineas, Gr.1, Manawatu Sires Produce S., Gr.1. 5 wins from 1200m to 1700m, A$186,790, to 2017-18, SAJC Fleurieu Milk Company H., 2d SAJC John C Harris 70th Birthday H., 3d SAJC Sangster S., Gr.1, Manihi Classic, L, 4th SAJC Durbridge S., L.
Served by Longma. Date of last service, 10.11.2017.